Attended by: Barbara Read, Michele Schweisfurth and Karen Harron. 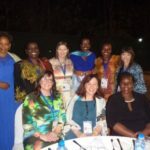 On the 21st August, the EGHE network headed to Lusaka, Zambia for the FAWE Conference for Girls Education in Africa, which also marked the 25th anniversary of the FAWE organisation. The conference attracted 500 delegates from 33 countries and was officially opened by the guest of honour Her Excellency, Mrs Esther Lungu, First Lady of the Republic of Zambia. Dr. Hendrina Doroba, one of the network members, is the Executive Director of the FAWE Regional Secretariat, based in Nairobi, Kenya. The conference theme was ‘Towards Gender Equality in Education: Positioning youth to Champion SDG Agenda 2030 & agenda 2063’; and you can read more about the objectives in the conference concept note. The EGHE were proud sponsors of the conference and our logo featured on the conference programme, which was a fantastic way to instantly promote the network across a wide and diverse audience. In addition to our participation as conference delegates and sponsor, we undertook additional activities to promote the network. PI Dr. Barbara Read co-facilitated a parallel session entitled ‘Repositioning the relevance of higher education in the world of work to achieve gender equality’. 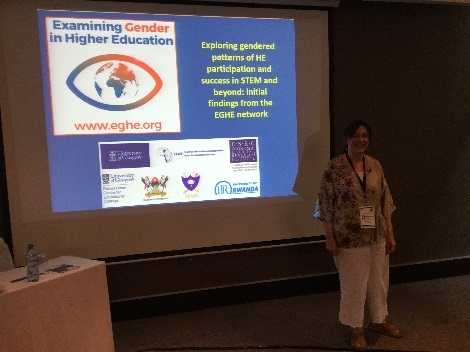 During the session, Barbara and network member Dr. Josephine Munthali delivered the network’s presentation “Exploring gendered patterns of HE participation and success in STEM and beyond: initial findings from the network’. 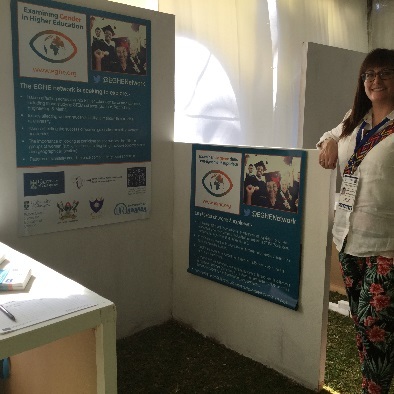 Karen Harron, Research Administrator, promoted the network from the EGHE exhibitor stand throughout the conference. The stand provided an opportunity to open up discussion with new contacts, and we will be exploring these connections for future potential collaborative research activities. We were even lucky enough to have a visit from the First Lady, who kindly signed our visitor sheet, although she seemed to forget to leave her contact email! We also took the opportunity to host a one-day meeting of the EGHE Network prior to the conference, since it was a rare occasion to have most of the members together in one country. The meeting was very successful and involved early discussions on plans to submit a subsequent research proposal to expand the research that this launch project has initiated.